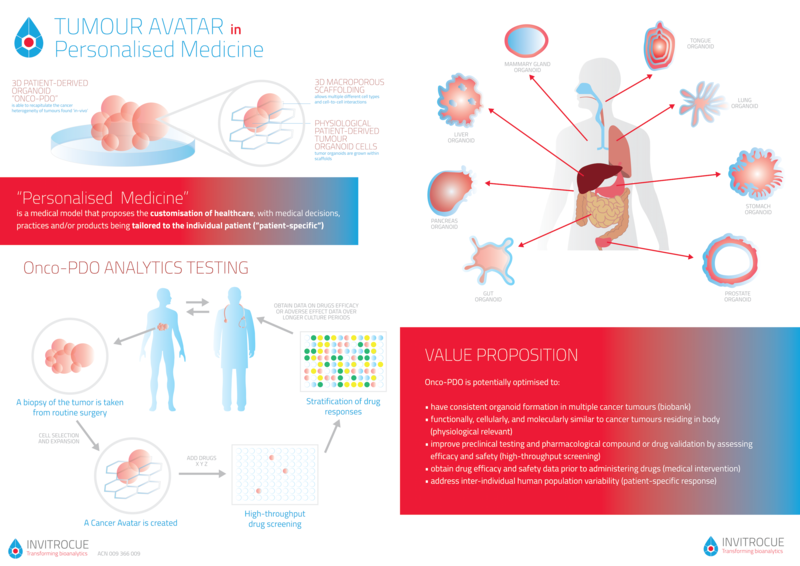 May 12, 2016 – InvitroCue (ASX:IVQ), a leader in advanced bio-analytics, announces today that it is planning to enter the oncology testing market for drugs to provide data points in selected solid tumours. Using its revolutionary 3D cell-based technology and proprietary processes, InvitroCue will be able to culture patient derived cancer cells in its laboratories for testing against a panel of approved drugs and new drug candidates; the company will be among the first to offer such tests. Onco-PDO®, will enable InvitroCue to grow in its laboratories patient-derived tumour cells (an organoid) initially for biopharmaceutical companies, medical researchers and academic institutions to understand the impact of cancer treatments prior to conducting time consuming and expensive clinical trials. Subsequently, Onco-PDO may also create a new market for personalised drug testing using FDA approved drugs to improve individual treatment outcomes in selected solid tumours. InvitroCue has entered into a research collaboration with the Second Affiliated Hospital Suzhou (Soochow) University, China to develop non-small cell lung cancer (NSCLC) organoids and for drug testing programs using approved drugs. “This is the first of many such collaborations that we will be looking to establish. We look forward to working with Suzhou University (Soochow) in this pioneering collaboration. Future target indications may include breast and colorectal cancers. We will also be seeking clinical partnerships in Australia, Europe and USA,” said Dr Fang. The above has been reproduced in Proactive Investors Australia. InvitroCue is an Australia-based biotechnology and life science services company. The Company focuses on the commercialisation of its analytics services using cell-based model and imaging based technology. Its cell-based services enable pharmaceutical and cosmetics companies to refine their drug, ingredient, compound or vaccine discovery efforts. Its digital pathology business offers a solution, including slide scanning and digitisation; image analytics of tissues and cells samples; pathology consultation with board certified pathologists, and telepathology via online Web-based portal. It provides products and services in the field of in-vitro drug metabolism and pharmacokinetic (DMPK), in-vitro toxicology and digital pathology utilizing cell-based models and analytics. It offers image analytics services for the liver disease application. InvitroCue’s technology, was spun out of Singapore’s Agency for Science, Technology and Research (A*STAR) has been developed and validated in collaborations with leading pharmaceutical companies and scientific collaborators.